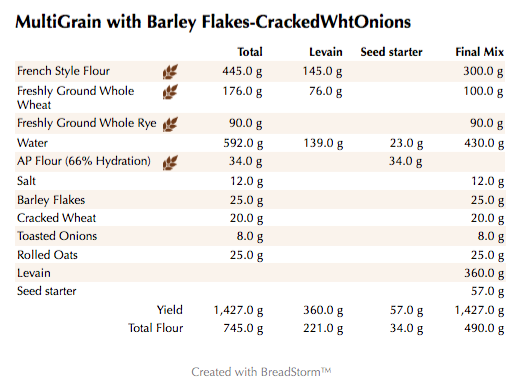 Multi-grain with Toasted Onions, Barley Flakes and more..
Usually with this list of ingredients I would either make a soaker or a porridge but instead I decided to add some crunch to the bread. 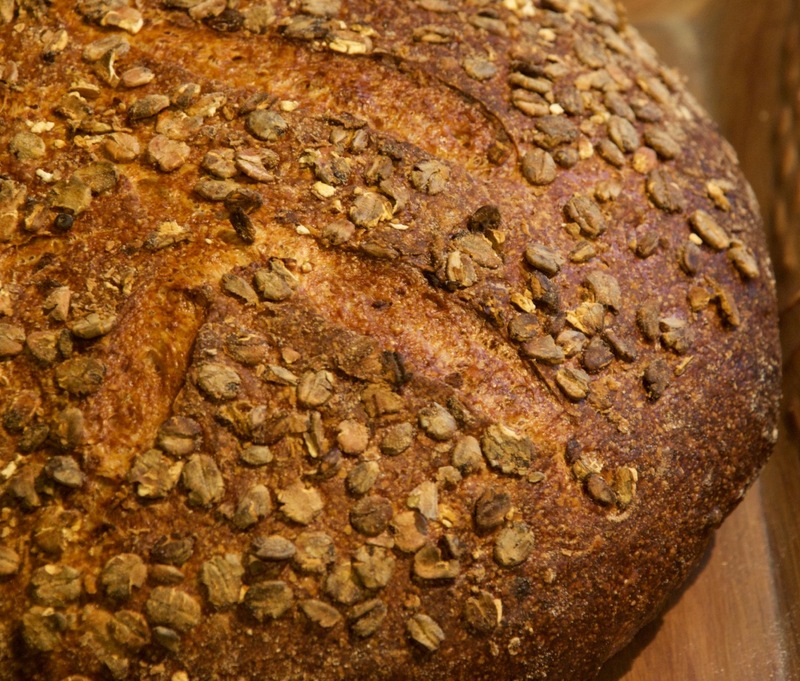 I used a combination of rolled oats, barley flakes, and cracked wheat and simply added them into the flour mixture of French style KAF, fresh milled whole wheat and fresh milled whole rye. I added some dehydrated toasted onions for a little extra flavor as well. I also coated the outside of the dough with malted wheat for an extra level of crunch. The final bread came out with a moderate crumb that was nice and moist with a thick crumb and overall tasty bread. This is one I would definitely make again. Mix all the Levain ingredients together for about 1 minute and cover with plastic wrap. Let it sit at room temperature for around 8-12 hours or until the starter is nice and bubbly. Stir the toasted onions in with the water and let it sit for a few minutes. Next, mix the flours, oats, barley flakes and cracked wheat with the water together in your mixer or by hand until it just starts to come together, maybe about 1 minute. Let it rest in your work bowl covered for 20-30 minutes. Next add the salt and starter (cut into about 7-8 pieces) and mix on low for 6 minutes. Remove the dough from your bowl and place it in a lightly oiled bowl or work surface and do several stretch and folds. Let it rest covered for 10-15 minutes and then do another stretch and fold. Let it rest another 10-15 minutes and do one additional stretch and fold. After a total of 2 hours place your covered bowl in the refrigerator and let it rest for 12 to 24 hours. (If you have a proofer you can set it to 80 degrees and follow above steps but you should be finished in 1 hour to 1.5 hours). When you are ready to bake remove the bowl from the refrigerator and let it set out at room temperature still covered for 1.5 to 2 hours. Remove the dough and shape as desired. Place your dough into your proofing basket(s) and cover with a moist tea towel or plastic wrap sprayed with cooking spray. The dough will take 1.5 to 2 hours depending on your room temperature. Let the dough dictate when it is read to bake not the clock. (I use a proofer set to 78-79 degrees and it usually takes 1 hour for initial proof and 1 hour for final proof after shaping). After 1 minute lower the temperature to 500 degrees and after another 3 minutes lower it to 450 degrees. Bake for 25-35 minutes until the crust is nice and brown and the internal temperature of the bread is 210 degrees. and start being adventurous. Until that time I can live vicariously though the compositions that you and dbm create. Lovely, and I like that you don't bake it in a Dutch Oven. "Not that there's anything wrong with that", but it seems most boules around these parts are made in D.O.s. I've got a thing for baking directly on a baking deck. Oh, and as to your "This is one I would definitely make again", my question is when will you ever have time to get around to the same formula twice??? Secondly....okay, so it's true I rarely make the same thing twice. The only thing I usually make often are pretzel rolls, pizza and sometimes hamburger buns :). I do prefer to bake on my baking stone. I have one extra large one on the bottom of my oven and one on the top for heat retention. Seems to work pretty well for me so I have never had any reason to try the D.O. method. I have a heavy duty aluminum rimmed sheet pan on the lowest shelf which I throw in 1 cup of boiling water and I'm good to go. You seem to be getting a bit more adventurous so I'm sure we'll be seeing some crazy bakes from you soon enough! Only did that once but once was enough after cracking a molar in half! Love the outside covered in malted wheat flakes though. I'm guessing they weren't thick enough to cause any dental harm. This one has to be tasty with 35-40% whole grains in the mix, healthy and hearty too. 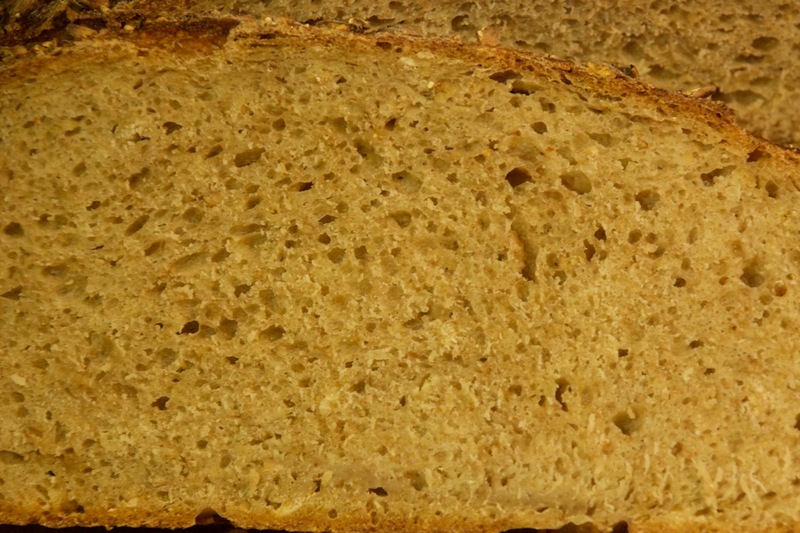 The French flour sure has a yellow tinge to it that really comes through in the crumb color. 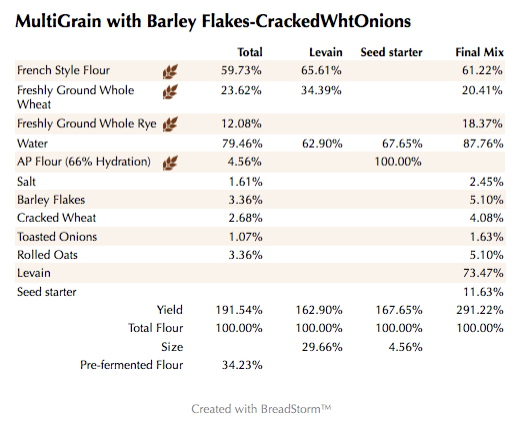 Lucy has a 72% whole grain, a bit less than half sprouted and 68% Kamut or semolina. What will stun you is that it is semolina porridge bread too. I'm finally getting back to porridge after a few years getting off the gruel and on to the sprouts - now it was time to mix them Altamura shape style. Love this one Ian and well done. Lucy sends her best bark tot he all the furry ones you keep at home with you. Surprisingly you no teeth breakers in this one even without soaking anything. I was surprised at how yellow this one came out since the French flour really is pretty white and nothing else I added is really yellow. I'm glad you liked it and look forward to Lucy's next master bake! I just baked off a porridge bread yesterday as well. I tried something a bit different that I'll blog about tomorrow most likely. Look forward to comparing our bakes. Quite the opposite of the beauties you're always presenting! Crunchy and flavorful! I also have some crunchies here that I want to use in bread. I have lots of ideas to try in bread making but I'm getting sidetracked with pastries. Will try this soon! Thanks! Glad you like it. Look forward to your next post. 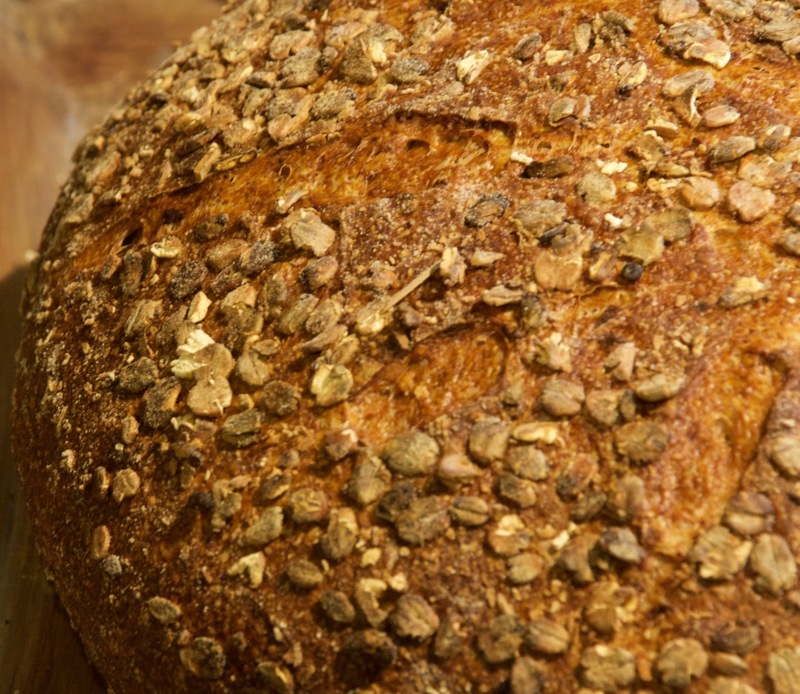 Lot's of whole-grain goodness packed into that loaf. This sure was a tasty one!